All of the C# code you've seen so far has had one thing in common. In each case, program execution has proceeded from one line to the next in top-to-bottom order, missing nothing. If all applications worked like this, then you would be very limited in what you could do. This chapter describes two methods for controlling program flow—that is, the order of execution of lines of C# code; branching and looping. Branching executes code conditionally, depending on the outcome of an evaluation, such as ″only execute this code if the variable myVal is less than 10.″ Looping repeatedly executes the same statements, either a certain number of times or until a test condition has been reached. Both of these techniques involve the use of Boolean logic. In the last chapter you saw the bool type, but didn't actually do much with it. This chapter uses it a lot, so the chapter begins by discussing what is meant by Boolean logic so that you can use it in flow control scenarios. The bool type introduced in the previous chapter can hold one of only two values: true or false. This type is often used to record the result of some operation, so that you can act on this result. In particular, bool types are used to store the result of a comparison. As a historical aside, it is the work of the mid-nineteenth-century English mathematician George Boole that forms the basis of Boolean logic. For instance, consider the situation (mentioned in the chapter introduction) in which you want to execute code based on whether a variable, myVal, is less than 10. To do this, you need some indication of whether the statement ″myVal is less than 10″ is true or false—that is, you need to know the Boolean result of a comparison. Boolean comparisons require the use of Boolean comparison operators (also known as relational operators), which are shown in the following table. In all cases here, var1 is a bool type variable, whereas the types of var2 and var3 may vary. var1 is assigned the value true if var2 is equal to var3, or false otherwise. var1 is assigned the value true if var2 is not equal to var3, or false otherwise. var1 is assigned the value true if var2 is less than var3, or false otherwise. var1 is assigned the value true if var2 is greater than var3, or false otherwise. var1 is assigned the value true if var2 is less than or equal to var3, or false otherwise. var1 is assigned the value true if var2 is greater than or equal to var3, or false otherwise. This code results in isLessThan10 being assigned the value true if myVal stores a value less than 10, or false otherwise. Here, isKarli is true only if myString stores the string ″Karli″. Here, however, you are limited to the use of the == and != operators. A common code error occurs if you unintentionally assume that because val1 < val2 is false, val1 > val2 is true. If val1 == val2, then both these statements are false. The result of these operators is exactly the same as & and |, but there is an important difference in the way this result is obtained, which can result in better performance. Both of these look at the value of their first operands (var2 in the preceding table) and, based on the value of this operand, may not need to process the second operands (var3 in the preceding table) at all. If the value of the first operand of the && operator is false, then there is no need to consider the value of the second operand, because the result will be false regardless. Similarly, the ‖ operator returns true if its first operand is true, regardless of the value of the second operand. This isn't the case for the & and | operators shown earlier. With these, both operands are always evaluated. Here, if var2 is zero, then dividing var3 by var2 results in either a ″division by zero″ error or var1 being defined as infinite (the latter is possible, and detectable, with some types, such as float). At this point, you may be asking why the & and | operators exist at all. The reason is that these operators may be used to perform operations on numeric values. In fact, as you will see shortly in the section ″Bitwise Operators,″ they operate on the series of bits stored in a variable, rather than the value of the variable. var1 is assigned the value that is the result of var1 & var2. var1 is assigned the value that is the result of var1 | var2. var1 is assigned the value that is the result of var1 ∧ var2. These work with both Boolean and numeric values in the same way as &, |, and ∧. Note that the &= and |= assignment operators do not make use of the && and ‖ conditional Boolean operators; that is, all operands are processed regardless of the value to the left of the assignment operator. In the Try It Out that follows, you type in an integer and then the code performs various Boolean evaluations using that integer. Create a new console application called Ch04Ex01 and save it in the directory C:\BegVCSharp\Chapter04. Execute the application and enter an integer when prompted. The result is shown in Figure 4-1. You use Convert.ToInt32()to obtain an integer from the string input, which is simply another conversion command in the same family as the Convert.ToDouble()command used previously. These variables are used in the next three lines of code, the first two of which output their values, while the third performs an operation on them and outputs the result. You work through this code assuming that the user enters 7, as shown in the screenshot. The first output is the result of the operation myInt < 10. If myInt is 6, which is less than 10, then the result is true, which is what you see displayed. Values of myInt of 10 or higher result in false. The second output is a more involved calculation: (0 <= myInt) && (myInt <= 5). This involves two comparison operations, to determine whether myInt is greater than or equal to 0 and less than or equal to 5, and a Boolean AND operation on the results obtained. With a value of 6, (0 <= myInt)returns true, and (myInt <= 5)returns false. The result is then (true) && (false), which is false, as you can see from the display. Finally, you perform a logical exclusive OR on the two Boolean variables isLessThan10 and isBetween0And5. This will return true if one of the values is true and the other false, so only if myInt is 6, 7, 8, or 9. With a value of 6, as in the example, the result is true. The & and | operators you saw earlier serve an additional purpose: They may be used to perform operations on numeric values. When used in this way, they operate on the series of bits stored in a variable, rather than the value of the variable, which is why they are referred to as bitwise operators. In this section you will look at these and other bitwise operators that are defined by the C# language. Using this functionality is fairly uncommon in most development, apart from mathematical applications. For that reason there is no Try it Out for this section. The leftmost bit of result is 1 if the leftmost bits of op1 and op2 are both 1, or 0 otherwise. The next bit of result is 1 if the next bits of op1 and op2 are both 1, or 0 otherwise. Continue for all remaining bits. By ignoring the 1 on the far left, you are left with the binary representation for 5, so while results such as ∼1 = −2 may look odd, the underlying structures force this result. The final line of code assigns a value of true to containsRed, as the red bit of myColor is 1. This technique can be quite useful for making efficient use of information, particularly because the operations involved can be used to check the values of multiple bits simultaneously (32 in the case of int values). However, there are better ways to store extra information in single variables (making use of the advanced variable types discussed in the next chapter). var1 is assigned the value obtained when the binary content of var2 is shifted var3 bits to the right. var1 is assigned the value obtained when the binary content of var2 is shifted var3 bits to the left. You are unlikely to use these operators in most code, but it is worth being aware of their existence. Their primary use is in highly optimized code, where the overhead of other mathematical operations just won't do. For this reason, they are often used in, for example, device drivers or system code. var1 is assigned the value obtained when the binary content of var1 is shifted var2 bits to the right. var1 is assigned the value obtained when the binary content of var1 is shifted var2 bits to the left. solves this problem by explicitly ordering the computation. C# enables you to label lines of code and then jump straight to them using the goto statement. This has its benefits and problems. The main benefit is that it's a simple way to control what code is executed when. The main problem is that excessive use of this technique can result in spaghetti code that is difficult to understand. myInteger is declared as an int type and assigned the value 5. The goto statement interrupts normal execution and transfers control to the line marked myLabel:. The value of myInteger is written to the console. In fact, if you try to compile this code in an application, the Error List window will show a warning labeled ″Unreachable code detected,″ along with location details. You will also see a wavy green line under myInteger on the unreachable line of code. This is perfectly valid code but very difficult to read! Try it out for yourself and see what happens. Before doing that, though, try to first determine what this code will do by looking at it, and then give yourself a pat on the back if you're right. You'll revisit this statement a little later, because it has implications for use with some of the other structures in this chapter. Branching is the act of controlling which line of code should be executed next. The line to jump to is controlled by some kind of conditional statement. This conditional statement is based on a comparison between a test value and one or more possible values using Boolean logic. Here, <test> is evaluated to obtain a Boolean value, and the result of the operator is either <resultIfTrue> or <resultIfFalse> based on this value. The result of the ternary operator is one of two strings, both of which may be assigned to resultString. The choice of which string to assign is made by comparing the value of myInteger to 10, where a value of less than 10 results in the first string being assigned, and a value of greater than or equal to 10 results in the second string being assigned. For example, if myInteger is 4, then resultString will be assigned the string Less than 10. This operator is fine for simple assignments such as this, but it isn't really suitable for executing larger amounts of code based on a comparison. A much better way to do this is to use the if statement. The if statement is a far more versatile and useful way to make decisions. Unlike ? : statements, if statements don't have a result (so you can't use them in assignments); instead, you use the statement to conditionally execute other statements. After this code is executed, or if it isn't executed due to <test> evaluating to false, program execution resumes at the next line of code. Code such as this, although more verbose, is far easier to read and understand than the equivalent ternary form, and enables far more flexibility. The following Try It Out illustrates the use of the if statement. Create a new console application called Ch04Ex02 and save it in the directory C:\BegVCSharp\Chapter04. Execute the code and enter two numbers at the prompts (see Figure 4-2). The disadvantage with this method is that you are performing three comparisons regardless of the values of var1 and var2. With the first method, you perform only one comparison if var1 < var2 is true, and two comparisons otherwise (you also perform the var1 == var2 comparison), resulting in fewer lines of code being executed. The difference in performance here is slight, but it would be significant in applications where speed of execution is crucial. It's a common mistake to write conditions such as if (var1 == 3 ‖ var1 == 4) as if (var1 == 3 ‖ 4). Here, owing to operator precedence, the == operator is processed first, leaving the ‖ operator to operate on a Boolean and a numeric operand, which causes an error. These else if statements are really two separate statements, and the code is functionally identical to the previous code, but much easier to read. When making multiple comparisons such as this, consider using the switch statement as an alternative branching structure. The switch statement is similar to the if statement in that it executes code conditionally based on the value of a test. However, switch enables you to test for multiple values of a test variable in one go, rather than just a single condition. This test is limited to discrete values, rather than clauses such as ″greater than X,″ so its use is slightly different; but it can be a powerful technique. The value in <testVar> is compared to each of the <comparisonValX> values (specified with case statements). If there is a match, then the code supplied for this match is executed. If there is no match, then the code in the default section is executed if this block exists. On completion of the code in each section, you have an additional command, break. It is illegal for the flow of execution to reach a second case statement after processing one case block. The behavior where the flow of execution is forbidden from flowing from one case block to the next is one area in which C# differs from C++. In C++ the processing of case statements is allowed to run from one to another. The break statement here simply terminates the switch statement, and processing continues on the statement following the structure. These conditions also apply to the default statement. There is no rule stipulating that this statement must be the last in the list of comparisons, and you can stack it with case statements if you want. Adding a breakpoint with break, goto, or return ensures that a valid execution path exists through the structure in all cases. Another way is to use constant variables. Constant variables (also known as just ″constants,″ avoiding the oxymoron) are just like any other variable except for one key factor: The value they contain never changes. Once you assign a value to a constant variable, then that is the value it has for the duration of code execution. Constant variables can come in handy here, because it is often easier to read code where the actual values being compared are hidden from you at the time of comparison. you will get an error and won't be able to compile your code. This also happens if you try to change the value of a constant variable through any other means after initial assignment. The following Try It Out uses a switch statement to write different strings to the console, depending on the value you enter for a test string. Create a new console application called Ch04Ex03 and save it to the directory C:\BegVCSharp\Chapter04. Execute the code and enter a name. The result is shown in Figure 4-3. The code sets up three constant strings, accepts a string from the user, and then writes out text to the console based on the string entered. Here, the strings are names. When you compare the name entered (in the variable name) to your constant values, you first force it into lowercase with name.ToLower(). This is a standard command that works with all string variables, and it comes in handy when you're not sure what the user entered. Using this technique, the strings Karli, kArLi, karli, and so on all match the test string karli. The switch statement itself attempts to match the string entered with the constant values you have defined, and, if successful, writes out a personalized message to greet the user. If no match is made, you offer a generic greeting. switch statements place no limit on the amount of case sections they contain, so you could extend this code to cover every name you can think of should you want … but it might take a while! Looping refers to the repeated execution of statements. This technique comes in very handy because it means that you can repeat operations as many times as you want (thousands, even millions, of times) without having to write the same code each time. Writing the same code 10 times seems a bit wasteful, and what if you wanted to change the duration from 10 years to some other value? You'd have to manually copy the line of code the required amount of times, which would be a bit of a pain! Luckily, you don't have to do this. Instead, you can have a loop that executes the instruction you want the required number of times. Another important type of loop is one in which you loop until a certain condition is fulfilled. These loops are slightly simpler than the situation detailed previously (although no less useful), so they're a good starting point. do loops operate as follows. The code you have marked out for looping is executed, a Boolean test is performed, and the code executes again if this test evaluates to true, and so on. When the test evaluates to false, the loop exits. The semicolon after the while statement is required. Here, you use the suffix version of the ++ operator to increment the value of i after it is written to the screen, so you need to check for i <= 10 to include 10 in the numbers written to the console. The following Try It Out uses this for a slightly modified version of the code shown earlier, where you calculated the balance in an account after 10 years. Here, you use a loop to calculate how many years it will take to get a specified amount of money in the account, based on a starting amount and a fixed interest rate. Create a new console application called Ch04Ex04 and save it to the directory C:\BegVCSharp\Chapter04. Execute the code and enter some values. A sample result is shown in Figure 4-4. Perhaps the most common usage of the ? : (ternary) operator is to conditionally format text with the minimum of code. Here, you output an ″s″ after ″year″ if totalYears isn't equal to 1. Unfortunately, this code isn't perfect. Consider what happens when the target balance is less than the current balance. The output will be similar to what is shown in Figure 4-5. Clearly, this adds unnecessary complexity. A far better solution is to use a while loop. while loops are very similar to do loops, but they have one important difference: The Boolean test in a while loop takes place at the start of the loop cycle, not at the end. If the test evaluates to false, then the loop cycle is never executed. Instead, program execution jumps straight to the code following the loop. This code has the same result as the do loop shown earlier; it outputs the numbers 1 to 10 in a column. The following Try It Out demonstrates how you can modify the last example to use a while loop. Create a new console application called Ch04Ex05 and save it to the directory C:\BegVCSharp\Chapter04. Execute the code again, but this time use a target balance that is less than the starting balance, as shown in Figure 4-6. This simple change from a do loop to a while loop has solved the problem in the last example. By moving the Boolean test to the beginning, you provide for the circumstance where no looping is required, and you can jump straight to the result. This rejects values that don't make sense, so the output looks like Figure 4-7. This validation of user input is an important topic when it comes to application design, and many examples of it appear throughout this book. For example, if you want a loop with a counter that increments from 1 to 10 in steps of one, then the starting value is 1; the condition is that the counter is less than or equal to 10; and the operation to perform at the end of each cycle is to add 1 to the counter. The format of the for loop makes the code easier to read, however, because the syntax involves the complete specification of the loop in one place, rather than dividing it over several statements in different areas of the code. The counter variable, an integer called i, starts with a value of 1 and is incremented by 1 at the end of each cycle. During each cycle, the value of i is written to the console. When the code resumes after the loop, i has a value of 11. That's because at the end of the cycle where i is equal to 10, i is incremented to 11. This happens before the condition i <= 10 is processed, at which point the loop ends. As with while loops, for loops execute only if the condition evaluates to true before the first cycle, so the code in the loop doesn't necessarily run at all. If you do this, though, the variable i won't be accessible from code outside this loop (see the section ″Variable Scope″ in Chapter 6). The next Try It Out uses for loops, and because you have already used several loops now, this example is a bit more interesting: It displays a Mandelbrot set (but using plain-text characters, so it won't look that spectacular). Create a new console application called Ch04Ex06 and save it to the directory C:\BegVCSharp\Chapter04. Execute the code. The result is shown in Figure 4-8. Details about calculating Mandelbrot sets are beyond the scope of this chapter, but you should understand why you need the loops used in this code. Feel free to skim through the following two paragraphs if the mathematics doesn't interest you; it's an understanding of the code that is important here. Each position in a Mandelbrot image corresponds to an imaginary number of the form N = x + y*i, where the real part is x, the imaginary part is y, and i is the square root of -1. The x and y coordinates of the position in the image correspond to the x and y parts of the imaginary number. For each position on the image, you look at the argument of N, which is the square root of x*x + y*y. If this value is greater than or equal to 2, you say that the position corresponding to this number has a value of 0. If the argument of N is less than 2, you change N to a value of N*N-N (giving you N = (x*x-y*y-x) + (2*x*y-y)*i) and check the argument of this new value of N again. If this value is greater than or equal to 2, you say that the position corresponding to this number has a value of 1. This process continues until you either assign a value to the position on the image or perform more than a certain number of iterations. Based on the values assigned to each point in the image, you would, in a graphical environment, place a pixel of a certain color on the screen. However, because you are using a text display, you simply place characters onscreen instead. Here, realCoord and imagCoord are the real and imaginary parts of N, and the other double variables are for temporary information during computation. iterations records how many iterations it takes before the argument of N (arg) is 2 or greater. Here, appropriate limits have been used to show the main section of the Mandelbrot set. Feel free to play around with these if you want to try ″zooming in″ on the image. Within these two loops you have code that pertains to a single point in the Mandelbrot set, giving you a value for N to play with. This is where you perform your calculation of iterations required, giving you a value to plot for the current point. Next, you have a while loop to perform your iterating. Use a while loop rather than a do loop, in case the initial value of N has an argument greater than 2 already, in which case iterations == 0 is the answer you are looking for and no further calculations are necessary. The maximum number of iterations of this loop, which calculates values as detailed above, is 40. This results in each row being separated from the next and lining up appropriately. The final result of this application, though not spectacular, is fairly impressive, and certainly shows how useful looping and branching can be. This code writes out the numbers from 1 to 5 because the break command causes the loop to exit when i reaches 6. In the preceding example, whenever the remainder of i divided by 2 is zero, the continue statement stops the execution of the current cycle, so only the numbers 1, 3, 5, 7, and 9 are displayed. Note that exiting a loop with goto is legal (if slightly messy), but it is illegal to use goto to jump into a loop from outside. Here, i isn't incremented until the last line of code in the loop, which occurs after the continue statement. If this continue statement is reached (which it will be when i is 2), the next loop cycle will be using the same value of i, continuing the loop, testing the same value of i, continuing the loop, and so on. This will cause the application to freeze. Note that it's still possible to quit the frozen application in the normal way, so you won't have to reboot if this happens. In this chapter, you increased your programming knowledge by considering various structures that you can use in your code. The proper use of these structures is essential when you start making more complex applications, and you will see them used throughout this book. You first spent some time looking at Boolean logic, with a bit of bitwise logic thrown in for good measure. Looking back on this after working through the rest of the chapter should confirm the suggestion that this topic is very important when it comes to implementing branching and looping code in your programs. It is essential to become very familiar with the operators and techniques detailed in this section. Branching enables you to conditionally execute code, which, when combined with looping, enables you to create convoluted structures in your C# code. When you have loops inside loops inside if structures inside loops, you start to see why code indentation is so useful! If you shift all your code to the left of the screen, it instantly becomes difficult to parse by eye, and even more difficult to debug. Make sure you've got the hang of indentation at this stage—you'll appreciate it later! VS does a lot of this for you, but it's a good idea to indent code as you type it anyway. The next chapter covers variables in more depth. If you have two integers stored in variables var1 and var2, what Boolean test can you perform to determine whether one or the other (but not both) is greater than 10? Write an application that includes the logic from Exercise 1, obtains two numbers from the user, and displays them, but rejects any input where both numbers are greater than 10 and asks for two new numbers. 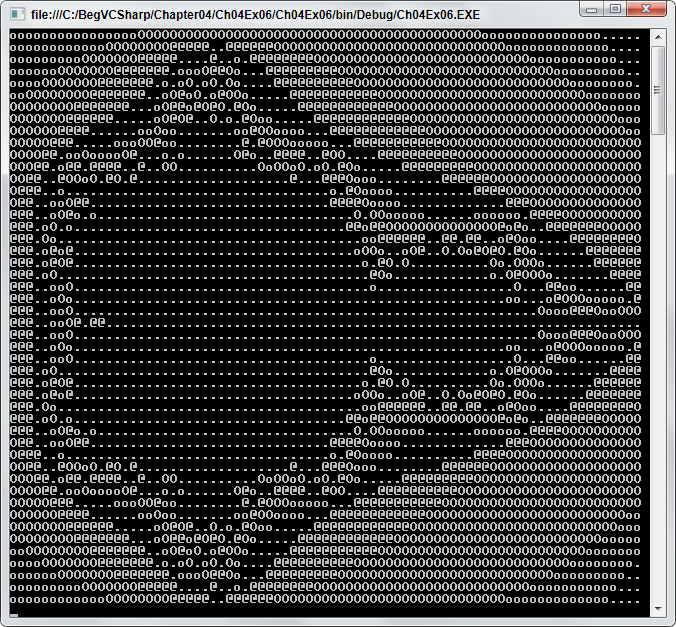 Modify the Mandelbrot set application to request image limits from the user and display the chosen section of the image. The current code outputs as many characters as will fit on a single line of a console application; consider making every image chosen fit in the same amount of space to maximize the viewable area. Boolean logic involves using Boolean (true or false) values to evaluate conditions. Boolean operators are used to perform comparisons between values and return Boolean results. Some Boolean operators are also used to perform bitwise operations on the underlying bit structure of values, and there are some specialized bitwise operators too. You can use Boolean logic to control program flow. The result of an expression that evaluates to a Boolean value can be used to determine whether a block of code is executed. You do this with if statements or the ? : (ternary) operator for simple branching, or the switch statement to check multiple conditions simultaneously. Looping allows you to execute blocks of code a number of times according to conditions you specify. You can use do and while loops to execute code while a Boolean expression evaluates to true, and for loops to include a counter in your looping code. Loops can be interrupted by cycle (with continue) or completely (with break). Some loops only end if you interrupt them; these are called infinite loops. Beginning Visual C# 2010, Copyright © 2010 by Wiley Publishing, Inc., ISBN: 978-0-470-50226-6, Published by Wiley Publishing, Inc., All Rights Reserved. Wrox, the Wrox logo, Wrox Programmer to Programmer, and related trade dress are trademarks or registered trademarks of John Wiley & Sons, Inc and/or its affiliates.